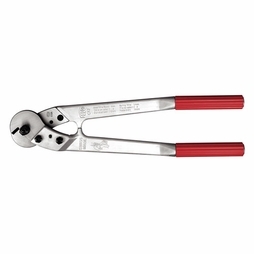 Felco cutters are generally considered to be the best that money can buy. Their blades are sharp, and tend to stay sharp longer than most others on the market. All of their cutters are ergonomic, making them comfortable and easy to use. The handles are lightweight aluminum and have plastic grips that feel natural in the hand. You routinely get clean, precise cuts without crushing the cable thanks to the triangular cutting system. Felco C9 Cutter: This small 13" cutter is easy to tote in a tool box, or to keep handy in your truck box. Despite its short length, the razor sharp blades make short work of cable 1/4" and under. 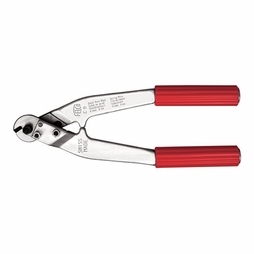 Felco C12 Cutter: Noticeably larger than the C9 cutter, the C12 has a nominal length of 20". It gives you quite a bit more leverage, and is the most common size of cutter we sell. In our shops, we generally do not use it to cut beyond 3/8" cable. Felco C16 Cutter: If you plan to make a lot of cuts, or if you want to cut up to 1/2" wire rope, then we recommend this largest cutter. At 23" in length, it gives you the most leverage of the three. You may see others claim that it cuts 5/8" cable (Felco's website does indeed specify 16mm), but our experience in the shop says that's a little too optimistic. 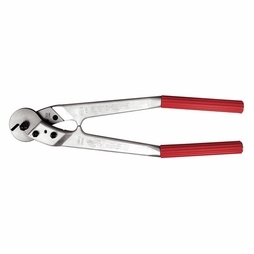 Still, it's a strong, tough cable cutter and the biggest Felco cutter we offer.